2011 will witness two biggest wedding of the century, Prince William marrying Kate Middleton and supermodel Kate Moss marriage to rocker Jamie Hince. Kate Middleton may mention the plans for her wedding to Prince William on April 29 in Westminster Abbey. But on the contrary, Kate Moss just excited for her wedding plans in July to tell. Kate Middleton wedding plans officially announced by Clarence House, the manager of British households. Meanwhile, Kate Moss undoubtedly very plainly told in the media. Clarence House announced to the media that William-Kate's wedding ceremony will be performed in a simple and solemn by the Archbishop of Canterbury, Rowan Williams, who then proceed to a formal reception at Buckingham Palace. In the evening, the event continued with a dinner, which aims for a narrow band, with Prince Charles as the host. Now, because marriage William-Kate is a national event that even the anticipated millions of pairs of eyes all over the world, the couple will also be an official release to be on a train a horse with a procession from Horse Guards Parade to Buckingham Palace, Westminster Abbey. Before the reception held by William-Kate to appear on the balcony of the palace as a tribute to the people who came and saw their wedding ceremony. Although the contours of the tradition of marriage for the royal family, Clarence House said William and Kate to do some things outside the line of tradition. "Not like the marriage between Prince Charles and Princess Diana, Prince William and Catherine (Kate) Middleton will to use the car to Westminster Abbey and then just do the parade in their carriages to Buckingham Palace," said a spokeswoman for Clarence House. 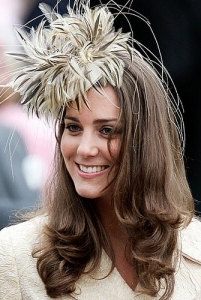 Another tradition also "violated" William and Kate to finance their own wedding, without disturbing the royal budget. As for the guests, Clarence House has revealed that a wedding ceremony at Westminster Abbey, there are around 2,000 calls are made up of royal families around the world, state leaders, political figures, celebrities as well. One of the famous celebrity couple David and Victoria Beckham, who confirmed it has received an invitation from Prince William and Kate Middleton. While still secret, which will be designing her wedding dress, Kate Middleton, via Clarence House, chose her sister, Phillipa (Pippa) Middleton, as Maid of Honor and the Prince William also chose his brother, Prince Harry, as best man. "I am very pleased and proud to be Best Man at the wedding of William and Kate are my sister, who always longed for," said Prince Harry. Contrast with Kate Middleton marriage full of secrets and have a formal touch, Kate Moss originally planning to massive star-studded wedding. To the media, 37-year-old supermodel has said he would carry out a wedding in the summer, on July 2, 2011. It also announced Moss's father and closest friends. "Kate and Jamie's wedding will be held in July. She would invite her celebrity friends, including ex-ex," said the source who wished to remain anonymous told the Daily Mirror. Moreover, also stated that Moss's daughter Lila Grace, the "leader" female companion. About wedding dresses, famous British supermodel was reportedly designing her own wedding dress. The news is "out"from the mouth of Vivienne Westwood, a friend of Moss for over 15 years. Westwood, who is also the top designers Great Britain, it appears that Moss will design the dress. "I think she will design her wedding dress sendiri.Dia lines is the set design and he knows the ins and outs of fashion. Yes, he knows what to do. He does not need my help," said Westwood. However, still a rumor that says Moss wearing a dress designed his friend, John Galliano, creative director of Christian Dior. Wedding dress worn Kate Moss was able to make headlines in the fashion world. Opted for a dress that Kate Middleton will be a headline all over the world. Bruce Oldfield, the designer who originally dijuarakan as designer wedding dresses Middleton, told Good Morning America, saying anyone who designed the dress Middleton later, it will get nightmares and dreams and so beautiful. "I believe, on April 29, after a simple dress she will not wear glamorous," he said. Oldfield said Middleton had sleeved dress because it is not possible for a bride who married in Westminster Abbey wearing a strapless dress. "Her dress must have the same elegance and sophistication with the church," he explained.